Managing staff performance is a huge issue for most businesses. Objective and goal setting is a great way for getting staff motivated and committed to the company and their role within the organisation. A happy Employee is generally a productive Employee. Identifying and addressing training needs can improve the performance of the employee and also contribute to their own development and job satisfaction. Staff achieving their goals assists the business in achieving strategic goals also. Having an annual performance review should be considered a minimum for all staff. Encourages open dialogue with the employee away from the day to day pressures of the job and facilitates both parties finding and correcting any issues before they develop into problems. 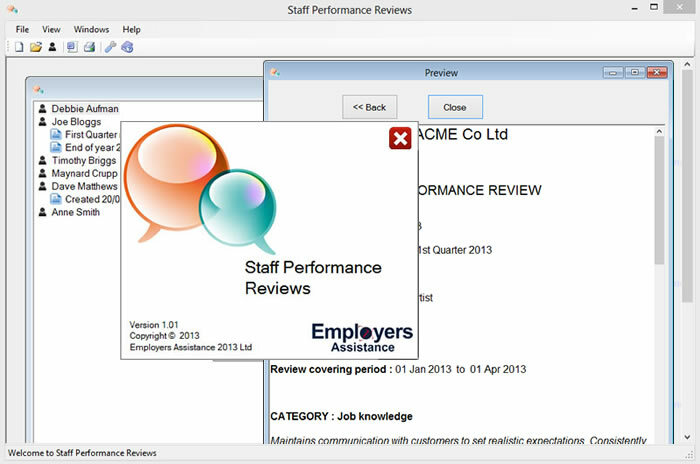 Staff Performance Reviews software creates a structured, consistent and fair approach to managing performance reviews. The software provides you with a framework to manage, organise and produce comprehensive performance appraisals and export them to Microsoft® Word®. Preloaded with an example standard performance review template and criteria to help you complete your own. Use the pre-defined forms in the software to create and manage your staff appraisals. We have developed this software program from our existing online Performance Reviews module in our Employers Toolbox Online. We have enhanced the user interface and review forms, and included a sample standard performance appraisal for you to use and customise. 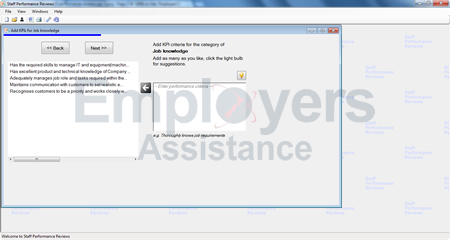 Users can download and install to their own PC and be in full control of managing staff appraisals. 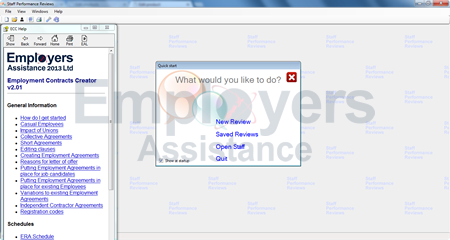 Templates can be created to use as a basis for similar staff roles within an organisation saving the user time. For an in depth guide to conducting and implementing Performance Reviews see the latest publication of our Improve Staff Performance eBook. If you PC does not have this installed our software will automatically download it for you.